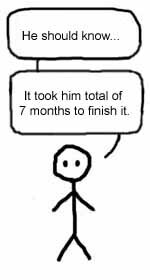 I wrote my Master thesis during this summer and most of the spring. My subject handled small and medium sized companies and their survival during financial crisis. 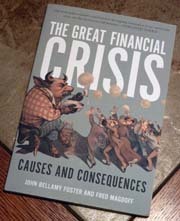 This led me to go through several articles and books about the crises, The Great Financial Crisis as one of them. The book is divided into two parts: “Causes” and “Consequences”. In the “Causes” the Authors go through household bubble, problems with multiplying debt and speculation as well as financial explosion. In the “Consequences”, Authors discuss about the implications of the Crisis to the world economy. As the book is written in 2009, this part is based mostly speculation. First of all I will have to give a warning. Many times I have stumbled upon this annoying tendency of people believing that the more difficult way you write, the more believable and scientific the article/book/thesis is. Sadly this attitude has a lot of support in the scientific world. The Authors of this book seem to promote this same attitude and I do have to say that this book is one of the most boring that I have read in a while. Even though I have mixed feelings about this book, there were some interesting arguments to highlight. In the book the Authors refer to Economists Paul Baran, Paul Sweezy and Harry Magdoff. According to them, “The stagnation is the normal state of the monopoly capitalist economy.” This interesting statement implies that growth in the economy has been and can be achieved only by temporary measures. Growth in itself does not come naturally to our economy. Another one is that in the 18th and 19th century economics in its classical state was called political economy. In the middle of the 20th century economics was purified from the political elements and was seen as a neutral science. However Authors argue strongly that in truth economics never ceased to be political. Class and power issues still matter behind the free market economy. Democracy, they claim, gives everyone an equal opportunity to take part in creating the system we all live in. However, as they teach in the basic economic lectures in the University, this is not the case. In truth in the democratic system small (but loud/influential/wealthy/arrogant) groups are often able to drive trough their own opinion disregard of it being good to the general public or not. A good example of this is that in the good times the top 20% of the population gains most of the profits from the economic expansion. However when everything crashes due to the overheating it is the bottom 80% of the population whom are left to pay the costs. The system plays in the advantage of its creators. In the countries where the economic system has been created having the general public in mind these problems have been avoided. A great example of this is Brazilian banking system, which has been immune to the financial crisis. When the owners of the banks have their own wealth at state in the case of the bankruptcy, not surprisingly the banks stand on a firm ground without the problems encountered in USA or Europe. Sadly even if the book had interesting insights, it was a struggle to finish it. Seriously, is it impossible to write a book about economics without making the result unreadable? In the end I would suggest this book only to the economists or to the ones not afraid of the complicated scientific language. It is not a bad book. However if you want to get anything out of it, you need both the time and the place in order to concentrate on it.